Product: Small Size Baking Tool. Material: Food grade plastic. Size: 19CM 6.8CM. 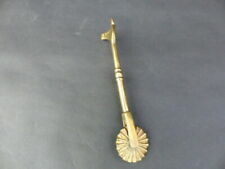 An antique brass pastry wheel cutter crimper, quite an unusual piece, size is approx 100 mm, 4" long. Photos shown for representation purposes only. Product specifications, availability, and pricing are subject to change without notice. Williams Sonoma Ultimate Fall Pie Crust Cutter Set. Please review pictures as they are part of the description. 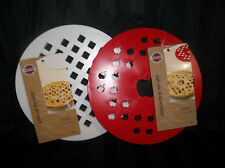 Nordic Ware Red Pie Top Cutter. One side has apples. One side has leaves. Flexipan® Rectangular Cake Cutter. Size: 3.75" x 1.57" (9,5 x 4 cm). Color: STAINLESS STEEL. Stainless steel cutters, with reinforced body. Photos shown for representation purposes only. Product specifications, availability, and pricing are subject to change without notice. Ausführung: Schnittbreite max. Bauteil ist einfach zu reinigen, spülmaschinengeeignet, wartungsfrei. Einfaches, rationelles und professionelles Schneiden von Plunderteig, Blätterteig, Marzipan, Fondant, Pralinenmassen, Mürbeteig. FUNCTION: Simply depress cutter over rolled out dough to create a lattice design for pies and other pastries. MULTI-PURPOSE: You can use it to make biscuits, cookies, chocolate,bread, pie, cake, pizza.etc. (6 high quality stainless steel pastry cutters. Perfect for cutting pastry, biscuits and cookies :-) Or play dough or. Stainless Steel Flower Cutters. This will be done asap but within 24 hours. This is because when occasionally there has been a problem I have always tried to sort it out! The double sided designs feature diamonds, hearts, flowers, stars, circles and squares and provide a variety of shapes for cookie designs. 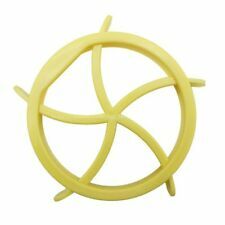 These cookie cutters are dishwasher safe, Set of six. we will do our great effort to help you out and solve the problem. MULTI-PURPOSE: You can use it to make biscuits, cookies, chocolate,bread, pie, cake, pizza.etc. 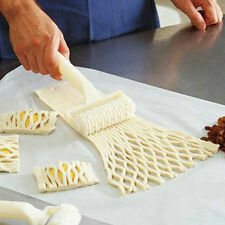 FUNCTION: Simply depress cutter over rolled out dough to create a lattice design for pies and other pastries. Mit gewelltem Rand, somit erhalten Ihre Teigwaren ein typisches Zackenmuster. Wenn man es schon selber macht dann soll es doch auch aussehen wie beim Profi. Unser Ziel ist es Ihnen ein Top Einkaufserlebnis zu bescheren. Pizzen, Kuchen und Teig sauber schneiden. Sicher: Fingerschutz sorgt dafür, dass Sie sich nicht schneiden - Saubere Finger - Öse zum Aufhängen. Kennen Sie das?. Der humorlos durch Pizzakrusten und -rinden gleitende Pizzaroller ist einerseits praktisch. Used but excellent. Really nice, looks hardly used. 20X(Type: Baking & Pastry Tools Material: Plastic Feature: Eco-Friendly Size: 20cm long, 6cm wide Color: white Package Contents: 1 x Pastry Roller knife Note: Light shooting and different displays may cause the color of the item in the picture a little different from the real thing. The measurement allowed error is /- 1-3cm.) MPN Does not apply Brand Unbranded EAN 191466305836 UPC 191466305836 ISBN 191466305836. 10er Set: 10 x origineller Rollschneider im Design eines Fahrrad - Tolle Geschenkidee für Zweiradfans. Er erfüllt nicht nur seine Aufgabe mit Bravour, sondern sorgt mit seinem verspielten Fahrrad-Design für beste Laune am Esstisch. Mit gewelltem Rand, somit erhalten Ihre Teigwaren ein typisches Zackenmuster. Mit robustem Griff aus Buchenholz mit Loch zum aufhängen an einer Küchenleiste/Haken. Sie erwerben hier einTeigrädchen GEBOGEN aus Italien. Product: Small Size Baking Tool. Material: Food grade plastic. Size: 19CM 6.8CM. Color: White. Material: Food grade plastic. Product: Small Size Baking Tool. Color: White. For making Mini Hand Pies, Pumpkin Shaped Pastries & Turnovers. Williams-Sonoma Pumpkin Shaped Pocket Pie Mold. Recipe Included on the Back of Box. A leaf shape butter knife for household use or as a gift to others. Box shows wear. Pastry cutter has not been used. 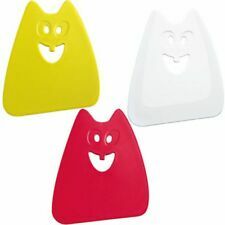 You are looking a lovely 4 x plastic pastry cutters 3 round white one 1 red gingerbread man shaped. A brilliant item to add to your collection. in good condition. Androck Stainless Steel Pastry Dough Mixer. Butterscotch Bakelite handle. Product: Small Size Baking Tool. Material: Food grade plastic. The images are for reference only. Size: 19CM 6.8CM. Color: White. Maple Leaf, Star, Pumpkin, Oak Leaf, Cherry and Apple. For your consideration is an original new in box Williams Sonoma piecrust cutter set. Can be used as Cookies mold, chocolate mould, also can be used as cut vegetables. 12 X Vegetable Cookie Mold Cutter. Cookies maker mold,favourite fillings tightly sealed in the bread,lovely design.